1. Japan's growth streak ends: The world's third biggest economy contracted at an annualized rate of 0.6% in the first quarter of 2018, according to government data published Wednesday. The slump follows eight consecutive quarters of growth, the longest expansion Japan has achieved since the late 1980s. The GDP reading was worse than expected, but some economists said Japan may be able to dodge a recession -- usually defined as two consecutive quarters of negative growth. Marcel Thieliant, senior Japan economist at Capital Economics, said rising wages are supporting consumer spending, while manufacturing and industrial production remain strong. "Even though firms' forecasts for industrial output for April and May are mediocre, industrial output should continue to recover. The upshot is that GDP should have returned to growth" in the second quarter, he wrote in a note. 2. Macy's earnings: Macy's (M) will report first quarter earnings before the opening bell on Wednesday. Macy's has had a hard time competing with online retailers and has recently embarked on a transformation. It has been selling real estate, shutting stores and investing in digital. The effort has paid off: sales climbed last quarter, and the stock has risen almost 19% this year. The sector could be improving too: The US government said Tuesday retail sales grew at a healthy pace in April. At the same time, relatively weak sales data for February and March were revised higher. 3. Starbucks in China: Starbucks is planning to build nearly 3,000 new stores in mainland China over the next few years, the company said on Wednesday. It's aiming to almost double its number of coffee shops in the world's second largest economy, from 3,300 at the moment to 6,000 before the end of 2022. Starbucks (SBUX) is hoping to triple its revenue and double its operating profit in China between 2017 and 2022. 4. 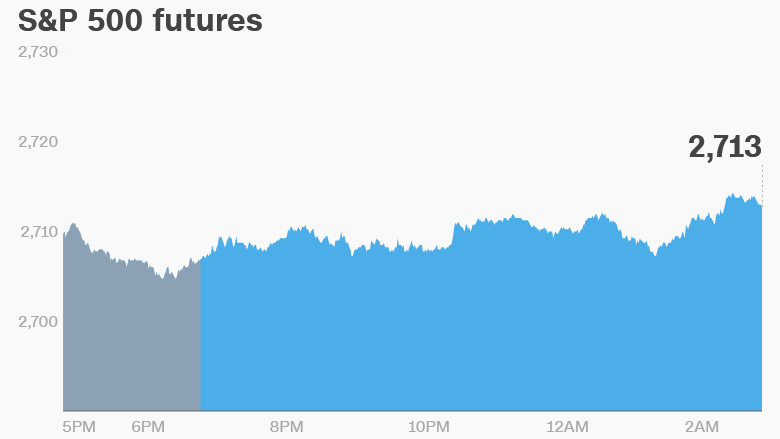 Global market overview: US stock futures were pointing up early on Wednesday. European markets opened higher, while stocks in Asia ended the session mixed. Oil prices were slightly lower early on Wednesday, with US crude futures trading at just above $71 per barrel. The Dow Jones industrial average and the Nasdaq both slumped 0.8% on Tuesday, while the S&P 500 closed 0.7% lower. The fall in the Dow marked the end of an eight-day winning streak and flipped the index back to the red for the year. The 10-year Treasury yield spiked to its highest level since 2011 as concerns about inflation drove a sell-off in bonds. The 10-year yield helps determine how much it costs to borrow money, including mortgages, car loans and credit card rates. 5. Earnings and economics: Cisco Systems (CSCO) and Jack In The Box (JACK) are set to release earnings after the closing bell on Wednesday. The Census Bureau plans to release its April Housing Starts report at 8:30 a.m. ET. Eurozone inflation data will be published at 5 a.m. ET. Mario Draghi, the president of the European Central Bank, will deliver a speech at 8 a.m. ET in Frankfurt.